Oh the Christmas tree! Is it not just the pivotal piece in your holiday decorating? Ok, I know I just mentioned saving money, but if you are going to have one big ticket item, I believe it should be the tree. For years, we have had the after Christmas special – the discount tree that no one else wanted, the Charlie Brown tree. To be honest, I hated it. It was too short and too scrawny, too thin and just too sad looking. I would decorate it, but was never completely happy with how it looked. I have just always wanted a big beautiful tree – a tree that reached toward the ceiling, a tree full enough that you couldn’t see through it and a tree wide enough to take 2 adults to string garland around it. I know, that seems pretty specific, but I believe if you have the right tree, you don’t have to spend a ton of money on decorations to make it look good. 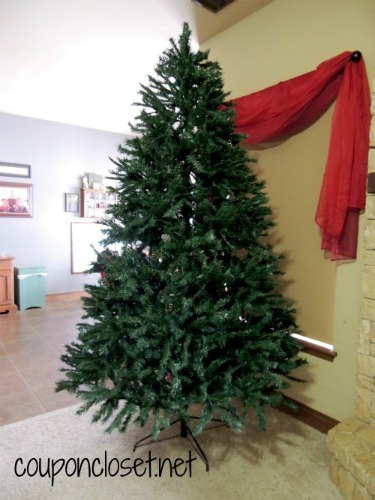 One way you can save on the tree of your dreams is to buy an unlit tree. Lights are not that expensive plus if you have a strand go bad, you can just replace that strand (as opposed to the entire tree if you had a pre-lit tree). Note: We found our tree at a local Garden Ridge store. This store no longer exists – it is now called At Home. Kohls actually some beautiful trees at great prices, especially if you use a coupon code and get kohls cash back. I highly recommend you check there too. Obviously, when you’re thinking about how to decorate a Christmas tree, you’ll need to decide what colors you want. Popular color choices are red with white, silver or gold. 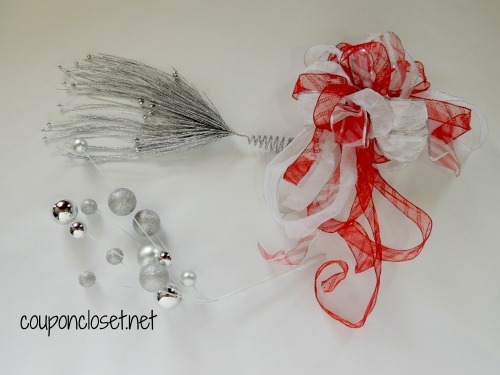 I chose red and silver and white for our tree. Just choose whichever colors make you happy, whatever colors remind you of the reason for the season. 😉 There is no wrong answer here – go with what you love. Once you decide on your colors, you can decide what types of items you want on your tree. Obviously, it is probably a no-brainer that you will have ornaments on the tree. The big questions is – what types of ornaments are you going to have? I just love the looks of glass ball ornaments, but they can be expensive. In order to save some money, we bought a large container of plastic ornaments (technically sold as “shatterproof ornaments”). That’s right, I said plastic. Now before you shake your head at plastic ornaments, hear me out. Yes, up close they look like plastic ornaments. However, when you put them on the tree, in the tree, they shine just as pretty as glass ornaments. One tip on how to decorate a Christmas tree with ornaments – don’t forget about depth! Don’t just hang ornaments one the end of the branches, but hang them deep within the tree too. 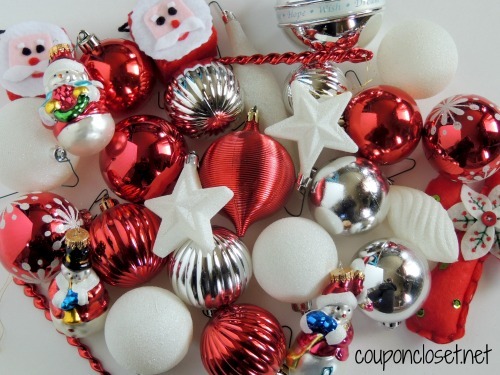 The plastic ornaments are perfect for placing throughout the tree. If you are worried about how they’ll look up close, you can always buy a box or two of glass ornaments to hang toward the outside of the tree. We bought some pretty glass snowmen (similar to these) as well as a box of red glass baubles (like these) just to mix things up a bit. I know adding garland to a tree is very popular, but I decided to go a different route – I used ribbon. I had seen a lot of trees on Pinterest decorated beautifully with ribbon, so I thought “Why not?” I bought a few different types of ribbon at my local craft store. I bought some 1″ wide ribbon and some 2-1/2″ wide ribbon. All of the ribbon I bought was wire rimmed – this is very important so you can shape it however you need to. I used the wide ribbon to cascade down the tree. We started at the top and just let it “flow” down the tree, securing with a 3″ length of pipe cleaner every several inches. I also curled the bottom of the ribbon for a more finished look. I use the thinner ribbon to make bows and secure them randomly around the tree. You want your ribbons to be similar and complimentary, but not the same. If you are worried about making bows, you can always buy pre-made bows, just know this will cost you a bit more than making them yourself. I probably had the hardest time with our tree topper. I knew what I wanted it to look like, but it just took a while before I got it to how I really wanted it. After playing around with the items I had, I finally made something that I was happy with – basically a great big bow with sprouts (for lack of a better word) coming out of it. I had seen what I wanted at craft bizarres, but I just didn’t want to spend upwards of $50 for my tree topper. For a great tutorial on how to make your own very big bow tree topper, check out Kristen’s Creations post on How to Make a Tree Topper. It is really easy to do and MUCH cheaper than buying one. There you have it. 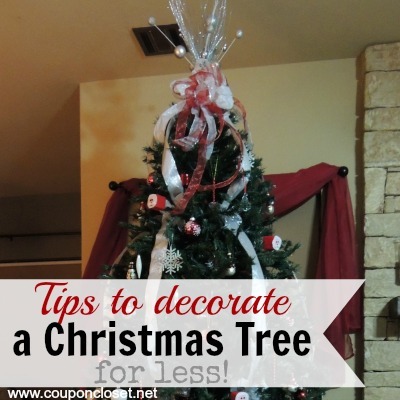 I hope you have received some inspiration when thinking about how to decorate a Christmas tree! Just keep in mind that you don’t have to spend a lot of money for your tree to look expensive. 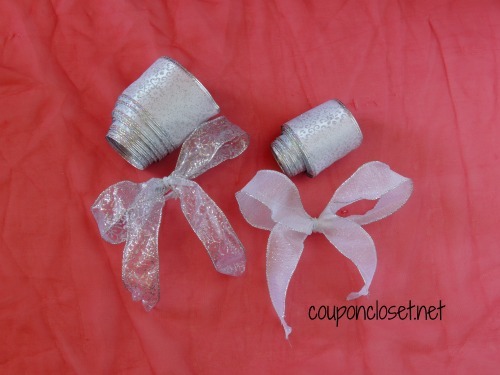 Even the most inexpensive decorations can add so much to your tree. Also remember to keep it simple. Your tree doesn’t need to be oozing decorations. Sometimes less IS more. What is your favorite way to decorate your Christmas tree? Do you like to do the same thing every year or do you like to mix it up from year to year? Whatever you prefer, be sure to share your Christmas tree decorating tips with us by leaving a comment.